Some take it seriously. Some bid it farewell just after the clock strikes twelve. Some call it a Second Chance to Dream with Eyes Open. New Year Resolution — no one can deny having made some. People change with time, so do their aspirations. Seriously taken, Happy New Year Resolution is an opportunity to gauge our goals. For the adventurous souls, it is the opportunity to tickle a funny bone or to try something bold. I’d like to offer a few ideas for you to consider. Some are simple, some are exotic – but each is unique in its own way – there is surely a one that would appeal to you! 1. Accomplish the Incomplete – If you still feel that the resolutions you made last year and abandoned midway are worth a second shot, give it another chance! 2. Realistic Resolutions – Instead of weaving dreams in the air, make a resolution that would have significance in and add a meaning to your life. 4. Quit an Addiction – It will not take you anywhere good, trust me. If it does you no good, why stick to it? If needed, seek help of support groups or professionals. If you have the will, you shall find the way. 5. Fit in Fitness – Secure a future with fewer trips to the doctor – exercise. Select a regime you can stick to. A group activity may add the element of fun to the routine. Lose some flab. But don’t set any strict target, for then the chances are you may get de-motivated and quit. 6. Soak up New Skills – Learning something new and interesting is always fun and a value addition too. 7. Lose the Loan – Pay off any debt you may have and feel light at heart. 8. Sack Stress – This sounds easier than it actually is, and there is no magic tip. You have to find your own haven. 9. Contribute for a Cause – Giving back to the society is the least we can do to make the world a better place to live in. 10. Treasure your Treasures – Splurge is fun, but saving should be the way of living. Plan with your future in mind. Relax the grip once in a while for that blissful indulgence. 11. Liven up Your Lifestyle – Professional growth is okay, but your personal life requires attention too. Strike a balance. Bulk: Watching the amount or bulk of wefts you place on your strands will save you a world of headache in the prevention of unnecessary hair loss. The bulk of the weave should never feel heavy or weighed down. The amount of tracks you invest in vary for each individual and should be based on the health, density, individual strand size and porosity of your hair. Quality of Track: If your feel persistent irritations to your scalp from the track of the wefts do not simply push this matter to the side. The irritation could be caused by the materials used for the track to hold the weft in tack. This is especially the case with tracks that are hard and stiff to touch. Look for tracks that are more pliable and softer. Constant irritation can cause scabbing and perhaps scarring where hair loss could be permanent. Proper Combing Technique: Just because the hair is not growing from your scalp you still want to use proper combing techniques when combing your weave. I recommend using a loop brush, and start from the ends and work your way to the root of the track. This will add longevity and decrease the amount of shedding of the weave due to less stress by combing your way up towards the track. Flexibility: Another advantage to wearing weaves is styling the styling flexibility. One word of caution, when styling your weaved hair in up-do’s, braids, twists and ponytails pay attention to the amount of stress your style creates. Too much force or action when creating a style can cause unnecessary stress to the track which will pull at the roots of your natural hair which could lead to hair loss. Opt for looser weaved up-do’s and styles that do not create stress to the track. Product Usage: Weaves need love to! Do not cop out on your favorite products while wearing a weave. Especially with human hair which is still susceptible to dryness. Lavender, Tea Tree and Grapefruit Seed Oil: Due to lack of air circulation while wearing a weave this creates a moist environment which is more susceptible to create a breeding ground for bacteria such as mold. Lavender, Tea tree or Grapefruit seed oil are natural mold killing agents. The application of these oils on your scalp while wearing a weave can reduce or deter molding issues immediately. Choose a Curl Pattern closest to your own Texture: This applies only if you are wearing the crown of your natural hair out or extensions. Choosing a weave or extensions that are closest to your hair pattern will drastically decrease constant manipulation in trying to imitate the curl pattern of the weave with your own natural hair. Wrap it Up: Wearing a weave does allow you the option to sleep without a satin pillowcase or scarf but from personal experience I would suggest not opting out on these hair care lifesavers. Satin pillowcases and scarfs can add longevity to your weave and bank account. When your hair is natural, relaxed and or color treated, steaming is one of the best things you can do to pamper your hair. Hair steaming is beneficial as the heat aids in hydrating dry hair leaving your parched tresses happy. The moist heat also encourages blood flow to circulate, promoting hair growth too! The steam lifts the hair cuticle allowing your treatments to penetrate deeply into the hair shaft helping to heal damaged hair. Steam once a week. 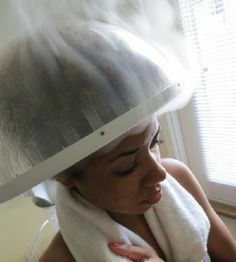 A weekly dose of steaming adds extra hydration to the hair. Over time, steaming aids in improving elasticity and moisture retention. Grab a washcloth. Steaming generates a lot of heat and the moisture may run down your face or drip onto your shoulder. Steam for 30 – 45 mins per session. The duration of your steam session is everything! Be sure to stay put under that steamer for maximum hydration. Give your cuticles time to lift and absorb the conditioner. Grab a magazine or your favorite book to help pass the time. Cover your head. You want your hair to be exposed directly to the moist heat. Allow your hair to feel the steam so that the conditioner can penetrate and work effectively. The direct steam melts the oils and/or deep conditioner into your hair immediately. Leave your hair down. Clip your hair up so that your ends, the oldest part of your hair will not be neglected and so you receive the benefits of the oils and/or deep conditioner under the direct moist heat. Go under the steamer right away. Wait at least 5-7 minutes to allow the steam to develop. During this time you can finish applying your oils and/or conditioner to your hair, clip it all up and then go under the steamer. Five to seven minutes is enough time for the water to bubble up and the vapors to get hot. Neglect your nape! Some steamers have a small hood making it hard to cover every inch of your head effectively. Try to position yourself, or your head, to get the steam on the nape area. This area tends to be a trouble spot for most, therefore it’s important not to forget it. Overdo it! Steaming is addictive; however, it should be done, at the very most, once a week. Increasing the frequency, on a weekly basis, can cause over-moisturizing. Over moist hair can lead to weak limp hair and possibly breakage. Winter brings holiday cheer, snow, and hot chocolate cozy fires. It is a beautiful and romantic time of year, but the winter months can have a negative effect on hair and skin. Due to the lack of moisture in the air caused from coming in and out of heated environments, there is a tendency for hair and skin to become dry and brittle. This can lead to breakage and sensitivity to chemical applications. Just like the seasons change, we find it necessary to change our skin and hair care regimen too. Hair must be maintained with moisture, protein and oil. This combination of conditioning treatments ensures proper strength, elasticity and shine to the hair. Dry / Brittle hair requires moisture to prevent breakage. Moisture is designed to add elasticity to the hair strand so when it is combed or brushed, it will stretch and return to its natural position thereby reducing and eliminating breakage. 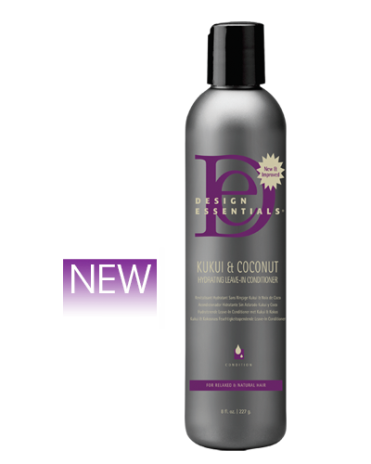 Kukui & Coconut hydrating Leave-In Conditioner is a deep penetrating leave-in conditioner designed to hydrate and recondition dry, thirsty hair for a silky smooth finish. Kukui extracts help condition, impart shine and restore moisture while Coconut extracts deeply penetrate the hair shaft and instantly soften, leaving normal to coarse hair soft and full of body and sheen. Use regularly on dry hair will help that hair maintain moisture during the harsh winter conditions. Dull and lifeless hair is common during the winter season. The extreme temperatures of going from warmth indoors to extreme cold outdoors robs hair of its needed moisture, which gives the hair life. Coconut & Monoi Deep Moisture Balm is a sophisticated, 10-in-1 all natural, no preservative blend featuring Shea Butter and ten of the most exotic and efficacious oils for repair, strength and shine. Infused with Marula Oil and Moringa Oil, this lightweight, highly moisturizing balm can be used as a hair and scalp moisturizer, defrizzer, heat protectant, and shine treatment. Also use on skin and body as a daily hydrator. Heated air had decreased humidity and therefore has a drying effect on our skin, nails and hair. Adding a humidifier will help replace moisture into the air, especially when you’re sleeping. Prevention is also an internal thing. There’s a greater need to replenish the water intake for the body for additional internal moisture. So increase your normal intake to at least two liters per day. Diet is also important. There is a tendency to diet after the holidays to shed extra pounds, however, remember that an inadequate diet results in poor growth of nails, skin and hair. Eat a sufficient amount of proteins, fresh fruits and vegetables to hydrate the skin, nails and hair. Include a good source of vitamins containing protein and vitamin E to your daily routine. Beware of some multiple vitamins that may contain too much vitamin A or sometimes referred to as Beta-Carotene. These in excess can cause hair loss. Remember you are what you eat! Springtime is so refreshing after the bitter cold of winter, and this season ultimately results in April/May showers, which help produce gorgeous blooming flowers. Where there are flowers, there is POLLEN! For many of us spring with all its glory also presents may physical challenges, since it is considered the worst time of year for those who suffer with allergies and severe sinus problems. Usually the remedy is to digest large doses of antihistamines, which is effective, but there can be serious side effects for the hair. Educate clients on how important it is that they moisturize the hair and scalp daily. The Therapeutics Rx Anti-Itch Shampoo and Hair + Scalp Treatment deposit zinc omandine directly to the scalp, alleviating itching and flaking, while the Leave-In Hydrating Conditioner works to soften and hydrate dry thirsty hair leaving it shiny and full of life. You should shampoo the hair every 7 to 10 days to eliminate medication build-up on the scalp and hair. You must drink twice as much water during this time to flush the body of the medications and replenish needed moisture. Taking an antioxidant will help the body rid itself of unneeded pollutants. During this time it may be necessary to reduce the degree of straightening with relaxers to approximately 85% to help maintain more elasticity and integrity of the hair. Healthy eating habits with high degrees of fresh fruits and leafy green vegetables is very important and always take a daily dose of multivitamins. Note: This is the time of year that you will experience the most growth. It follows the pattern of nature. Fall and winter, plants and trees don’t produce new foliage. However in spring and summer new plant life and greenery are abundant. Let’s water our plants and moisturize our roots. Changing temperatures mean a change of routine, no matter which part of the world you live in. Knowing a little about how skin functions in the winter, and tweaking a few habits, can make all the difference between a dull winter complexion and glowing radiance. * Start the day with a hot shower… but before you get out switch to cold water for about fifteen seconds. Then turn up the heat a little, and down again to repeat the process for about two minutes. “Why would I want to do that? !” I hear you cry! This is a simple hydrotherapy technique which revitalizes the skin by stimulating the flow of blood through the body. It is both invigorating and highly beneficial to the skin. So even though you may not really enjoy the process, just think of the all the good it’s doing you! * Use a good moisturizer. Choose a highly protective day cream which contains zinc oxide, and provides SPF30 protection to form a barrier against the elements. Creamier, water-in-oil emulsions are best. And don’t forget about your lips. Chapped lips are often the most noticeable problem for a lady in the winter. Use a highly moisturizing lip balm which provides a protective barrier, with vitamin E for good elasticity. * Exfoliate at least twice a week. This will remove dead cells and allow the skin to absorb extra moisture. The oil which we all complain about in the Summer is no longer being produced because of cooler winter temperatures and central heating. Therefore the skin looses the water which should be retained in the lower dermis of the skin. This can lead to premature aging of the skin and fine lines, whilst your skin can appear puffy and grey. Nice! * Drink a glass of hot water with lemon. This Chinese herbal remedy is a sure-fire method of energizing your body. It will de-tox your entire system, including the liver and gall bladder. This means that your body will be able to clean the blood faster to get rid of toxins responsible for bad skin. * Simply sleep! Money can’t buy the benefits of a good nights’ rest. Your oxygen levels will drop if you don’t get enough sleep, meaning that your cells will not be renewed as quickly. This is when degenerative skin aging sets in. Try to get seven, if not eight or nine hours of rest a night to achieve absolutely painless benefits. It’s ideal!